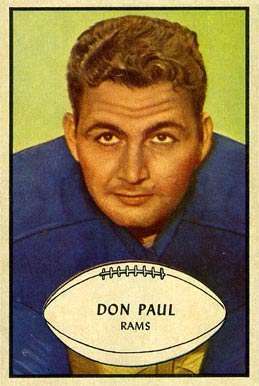 Don Paul (March 18, 1925 – November 8, 2014) was a professional American football linebacker who played for the Los Angeles Rams (1948–1955) in the National Football League. He was selected to three Pro Bowls during his years with the Rams. He was inducted into the UCLA Athletic Hall of Fame in 1986. He was one of only two players to play in six UCLA-USC games during the World War 2 years. After Paul's football career he joined up with Roy Harlow and established the Rams Horn restaurant. Later he and Harlow teamed up with former LA Ram great Bob Waterfield and The Voice of the Rams Bob Kelley and opened up the Pump Room restaurant. He died after an illness on November 8, 2014.